Our Abpromise guarantee covers the use of ab20206 in the following tested applications. 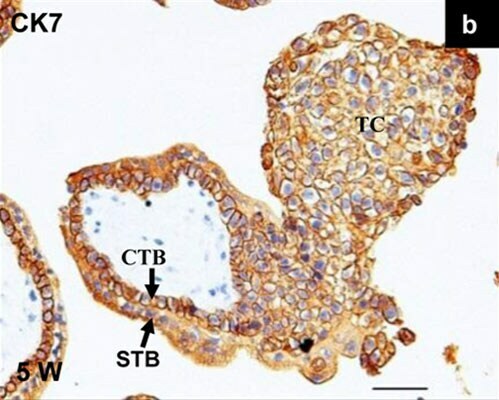 Immunohistochemistry (Formalin/PFA-fixed paraffin-embedded sections) - Anti-Cytokeratin 7 antibody [LP1K] (ab20206)Image from Zhang Q et al., PLoS One. 2012;7(6):e38487. Epub 2012 Jun 5. Fig 1.; doi:10.1371/journal.pone.0038487; June 5, 2012, PLoS ONE 7(6): e38487. Immunohistochemical analysis of formalin-fixed, paraffin-embedded Human placental villi in the first trimester. Cytokeratin 7 was stained using ab20206 at 5 µg/ml. Sections were incubated with biotinylated secondary antibody followed by streptavidin-peroxidase, and was detected with DAB. Publishing research using ab20206? Please let us know so that we can cite the reference in this datasheet. There are currently no Customer reviews or Questions for ab20206.